A huge storm was hitting the Mediterranean. The sailors taking their ship from Joppa to Tarshish were terrified at their prospects of survival. Jonah wasn’t terrified, he was asleep. Perhaps it was because of their pagan, superstitious view of the world, but they had a sense that there was for a reason for the storm. They were right. When they “cast lots” to try and figure out “whose fault” it was, the lot fell to Jonah (see Prov. 16:33). 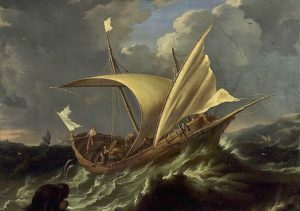 Earlier in the voyage, perhaps over a dinner of pita bread and hummus, Jonah told them that he was “fleeing from the Yahweh”, but hey, anybody might want to flee from the God of Israel. When they found out that Jonah was not only fleeing from God but that he was an Israelite who knew and worshipped Yahweh, they knew things were serious. I’m not sure these men realized the depth of Jonah’s rebellion. He was a prophet of Yahweh, and he was running from the mission God sent him on. Isn’t it interesting that sometimes others are more aware and even more concerned about our faults and shortcomings than we are? And they don’t even know God? They were taking this storm more seriously than Jonah was (after all he had been sleeping during the storm). They were correct. Believer, is it time to wake up?